Thomas, Bob (1991). Disney's Art of Animation: From Mickey Mouse to Beauty and the Beast. প্ৰকাশক New York: Hyperion. ISBN 1-56282-899-1. Barrier, Michael (2008). The Animated Man: A Life of Walt Disney, University of California Press. ↑ "Walt Disney". IMDB. http://www.imdb.com/name/nm0000370/। আহৰণ কৰা হৈছে: 2008-05-21. ↑ Dave Bryan (2002-08-13). "Walt Disney Helped Wernher von Braun Sell Americans on Space". Associated Press. Archived from the original on 2002-08-16. http://web.archive.org/web/20020816210006/http://www.space.com/news/spacehistory/vonbraun_disney_020813.html। আহৰণ কৰা হৈছে: 2010-09-27. ↑ "Walt Disney Academy awards". Academy of Motion Picture Arts and Sciences. http://awardsdatabase.oscars.org/index.jsp। আহৰণ কৰা হৈছে: 2008-05-21. "Walter Elias Disney". FBI Records: The Vault. U.S. Federal Bureau of Investigation. 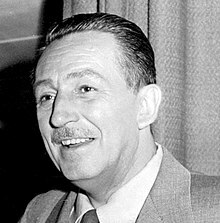 http://vault.fbi.gov/walter-elias-disney/.